This stately executive home in Deercreek CC has curb appeal galore that beckons you in & will win your heart at first sight! Light & bright best describes the home's interior. It sits on a premium golf course lot with a water view. The Kitchen is open to the Family Room, breakfast nook & a huge screened-in Lanai that boasts a 270 deg. view of the course, lush foliage & a pond with an island! A 2-sided fireplace adds warmth & charm to both the Family Room & a formal Living Room. The spacious 1st floor Master Bedroom has a double tray ceiling & bayed window, His & Hers closets & vanities, garden tub & lrg walk-in shower. Split bdrm floor plan features 1 other bdrm downstairs, plus 2 additional bedrooms upstairs sharing a full bathroom. Oversized side-entry garage has handy built-in storage. Additional Features and Amenities Great location on Jacksonville's Southside, convenient to Avenues Mall, restaurants and more. 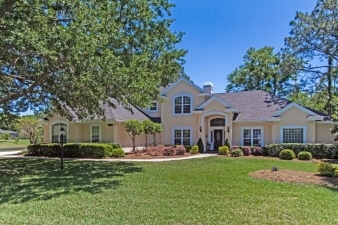 Well maintained desirable community with outstanding amenities in addition to the golf course.